Sometimes, when I sit and think about what life has thrown at Jon and I since we’ve been married, I can hardly believe we’re still standing at all. Together we vowed to stick by each other in the good and bad times, in sickness and in health, and believe me, we’ve lived the truth of those vows ever since. Our wedding day was magical, truly the best day of my life and everything we dreamed it would be. I would marry Jon again in an instant. But it isn’t the wedding that makes the marriage. Marriage is so much more than the beautiful white dress, presents and being centre of attention for a day. Marriage is two people living it. Staying together, strong, faithful and true whatever life may throw at them. The first thing to be thrown at our new marriage was our honeymoon. An exotic Carribean dream holiday – but it nearly killed my brand new husband. The first 8 days in St Lucia were just lovely; we enjoyed sunshine, cocktails, boat rides, a helicopter tour of the island. And then Jon started developing pains in his chest. It hurt him to breathe, the pain over the next two days becoming more and more severe. Jon being Jon, refused for me to call a Dr while we were there and so we got on a plane to come home. The flight was awful, Jon was in so much pain he didn’t know what to do with himself. We landed at Gatwick and STILL he refused to go to the hospital there – I drove home, at super speed, to get him to our hospital because by now I knew something was terribly wrong. We arrived at the Royal Gwent and he was swiftly admitted and hooked up to loads of machines, being pumped with painkillers. A few hours later we had his diagnosis; a pulmonary embolism and pneumonia. Jon had several blood clots in his lungs which developed on the 8 hour flight out to St Lucia – the Dr couldn’t emphasis enough how he was an incredibly lucky man to have arrived home alive. My new husband was very poorly and spent the next 10 days in hospital, and the first 6 months of our married life on Warfin, having to have his blood constantly monitored. Of course amongst all this, we did create our beautiful Belle and she bought us so much happiness. In fact out of everything in the last almost 15 months we’ve now been married, Anabelle’s 32 weeks with us were the happiest of all. But in April, our next major concern was thrown at us. Jon developed worrying sensory issues – and these have remained with him ever since. Jon can no longer feel his hands, he had no sense of touch, infact he often doesn’t know where is hand is of what it is touching, unless he is looking at it. He suffers great difficulties with fine motor control and he suffers with sporadic double vision. There has been other altered sensory awareness sporadically around his body, but his hands have been constant. For 6 months now. It’s incredibly debilitating and a constant worry to us both. The process of starting tests was very slow, I was getting more and more stressed, but Jon is finally under the care of a neurologist and we hope that a conclusive diagnosis will be imminent after a lumber puncture that has now been ordered. I just pray that the news is good because it is our turn for something positive. We’re living in sickness and in health. We’re living in good times and bad. Our baby daughter died in our first year of marriage. What greater trial can a new marriage overcome than two all consuming grief stricken people? We’re coping with our Anabelle’s death in very different ways, but throughout it all we’ve been very together. We are surviving and my darling husband has been my rock. I find so much comfort in our rings – the unbroken circle of forever love, the rings that connect us and symbolise our life together. When we were in hospital having Belle and Jon had his arms around me, it was our hands and rings next to each other that still managed to give me some comfort. We were together in it and I really don’t think there is anything else like the bond between a husband and wife. Our hearts were broken but nothing could ever or will ever break our togetherness. Vows are not just something you say in front of people because you want a wedding. The real meaning behind those vows comes through life, and the experiences that life throws your way. Vows only become real when you stick at them when the worst possible things are happening. When you continue to mean them and live them every day. My marriage is strong and I knew it would be before I married Jon. Our relationship has always been strong from the very beginning. 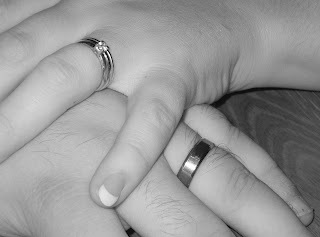 I love my husband very much and we’re living our vows, and we’re surviving. We’re more than surviving because we’re a marriage. Even beyond death do us part.